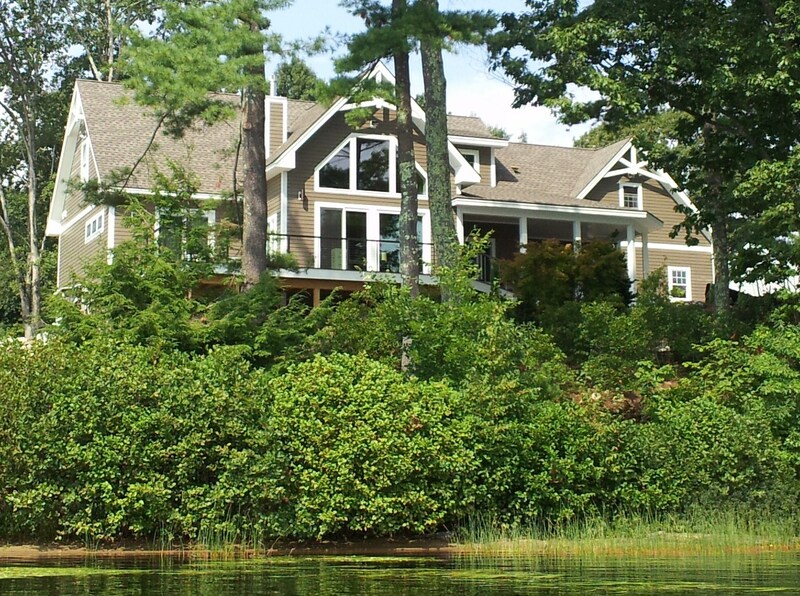 Located on a small lake in southern New Hampshire and offering peaceful views from its privately positioned outdoor living room, this gorgeous open concept home was designed with preservation of the native landscape in mind. Offering main level living, beautiful hand milled native New Hampshire black oak wide plank flooring, a great room with cathedral ceilings, a 16-foot floor to ceiling fieldstone fireplace, a grand wrought iron staircase leading to a top floor loft with a view that takes your breath away, custom cherry kitchen cabinets and granite counter tops with a matching walk-in pantry and layout ready to entertain. Stepping into this custom home you instantly feel the warmth and beauty while getting to enjoy looking out onto one of New Hampshire’s beautiful pristine lakes. This home was custom designed and built for the homeowners and it is a perfect display of all the craftsmanship in a New England home minus all the high energy cost and drafty walls. The warm black oak floors combined with the knotty pine great room ceilings provides the sense of warmth and coziness throughout the house. Also not to mention that the same crew that installed all the ICFs and poured the concrete walls was the same crew that installed all the framing, installed the trim and siding as well as all the interior finish work such as the kitchen, stairs doors and trim. This home is truly one of a kind! We met the homeowners during the 2010 Parade of Home at another ICF home we were selected to showcase. During the tour, the homeowners instantly fell in love with the energy efficiency of the home and the idea of the ICF walls. They had been living in a 3100 square foot home built in 2004 and they were using 500gallons per month during the cold winter months. They were amazed that home being show was heating 4200 square feet and estimated to use 500 gallons per year total. Two weeks later the design and planning phase began. We spent a fair amount of time positioning the house on the lot which consisted of a drastic 7ft elevation change in the middle of the lot and close neighboring properties. Placing the house in the middle of the ridge provided the perfect elevation change for the walkout basement level. We then rotated the house approximately 15 degrees southwest which allowed us to capture the day long sun on the sun deck and provide a sense of seclusion for the outdoor living room that looks out over the lake. We integrated landscape design into the planning phase so that the house and landscaping would complement each other and preserve the native landscape and terrain. We created a stormwater management system consisting of 3 dry wells branching off the lakeside corners of the house. Large natural flat stones were placed together creating walkways, patios, and stairs around the perimeter of the home and to the water’s edge. Strategic planters and landscaping were used to mask mechanical venting and utilities. New Hampshire has strict regulations when building along shorefront. A shoreland permitting process can add 75 or more days and significant cost to the preconstruction process. The first priority was to install the erosion control system which consisted of 275ft of 4ft silt fence with 6 inches buried in the ground and 92 bales of hay that were stacked in line along the fence to prevent any siltation. One other big item that needs to be mentioned is the New Hampshire winters and the difficulties that it can bring to the building industry. It was early November and we were in the middle of installing the ICFs. After packing up for the evening with clear skies and no indication of in climate weather, we returned to a site covered with 1/2-inch of lake effect snow. Just enough to make us wait. Around 11 am the sun had melted the ice & snow enough to continue with the walls and with more winter coming we prepped the site each night ensuring all the walls and materials were protected. This home is 5+Star Energy Star Version-3 certified and a HERS Index of 41 without the expense of geothermal, solar, or wind. During the planning phase, we considered using solar or geothermal to supplement some of the fuel consumption. After evaluating the efficiency of the ICF building envelope the return on investment was not practical and the goals could be achieved through efficiency alone. Therefore, We chose the Dave Lennox Collection 97% AFUE 70 BTU variable speed furnace and 36kBtuh Cooling system. Along with a 97% efficient, 34 gallons, commercial grade 100,000 BTU hot water heater. To maximize the ICFs energy efficiency we chose the Pella 350 series triple-pane low-E w/ argon and a U-factor of (0.17-0.19). These windows are approximately 40% more efficient than your standard window. The homeowners are very excited and looking forward to reducing their fuel consumption by approximately 70% with an estimated 400gallon per year fuel consumption. Consisting of 16 different corners, 10’-8” tall basement walls, 9’-4” tall Main Level walls, a 19’-0 tall great room gable end wall, and oversized window and doors, this home is far from your average home. The complexity of the design and the importance of keeping the walls plumb, straight and square we opted to take a unique approach when installing the 10’-8” tall basement level walls. First, we installed our footings and frost walls as we normally do. Then we installed the perimeter drain and prepped the under slab interior grade. We snapped or lines and installed & braced the ICF blocks normally, but before we poured the concrete we installed the first level floor frame system (Joist, Beams & Sheathing). Once we had the main level floor system installed and sheathed we were certain the corners and walls were exactly where we wanted them. We used the main level floor as our staging and gently walked around and pumped the foundation walls. We have used this method in the past for complicated foundations and wall layouts and it works really well. There are many benefits using this technique: You are able to pre-cut your entire floor system; you do not need as-built measurements to try to adjust if your walls grow a little, and using the main level floor as your staging provides a safe comfortable working area. Most importantly you know that your floor is square so that you can keep your layout true which saves time when it comes to finishing work. A unique feature is the 19-foot tall wall in the great room that is home to a 12×8-foot door sliding door and a 12×6-foot trapezoid gable end window. Combined with a 12/12 roof pitch we basically had to create a 19-foot tall arch that would support the ridge beam above. Using some extra floor joist and our standard staging and turnbuckles we battled the brisk December wind to keep our wall in position while we pumped it standing 15ft above the subfloor. Low maintenance is also a key factor. We used Hardie Plank & Hardie Trim cement board products for the siding and exterior trim. In the great room, we built a 16-foot floor to ceiling fieldstone fireplace which houses a gas fireplace and all the electronics for a 50-inch TV mounted above the mantel. The mantel is made from reclaimed oak trees that were removed from the site before construction. The main level floor is native New Hampshire black oak wide plank flooring custom milled for this project. To complement the flooring we installed 1×8 v-groove knotty pine to the ceiling of the great room. In the basement 4-inches of EPS, rigid foam under the slab is plumbed for future radiant heat. This home is truly custom, designed and built to meet and exceed the owner desires and needs. Surprisingly ICFs are still fairly foreign to many people and builders throughout the New Hampshire. With this particular project were able to capture the eye of “Granite State Builder” magazine which is a statewide building magazine that caters to the New Hampshire Home Builders and Remodelers and this ICF home had a 4 page feature article about the ICFs and the energy efficiency of this home while we were in the construction phase. 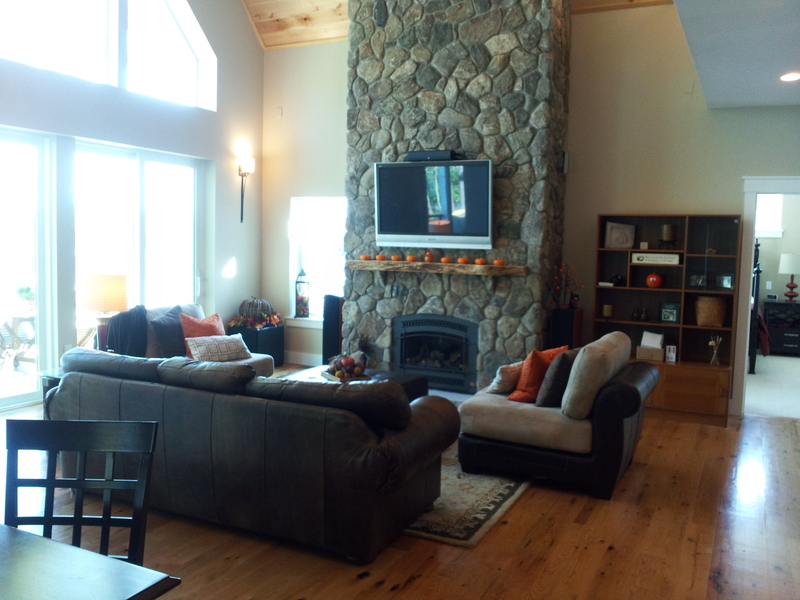 Just this past weekend we were one of 7 homes selected to showcase the home in the New Hampshire Parade of Homes. The HERS rating of 41 means this home is 59% more efficient than your standard home. When showcasing this home most people are surprised that this home is made of concrete. The only visual sign that this is not standard construction are the deep window sills which everyone seems to love because now you have a seat or a shelf. The homeowner moved into the home this past August and at least once a week we get and email and a phone call from them thanking us for their home. They couldn’t be happier with it they just absolutely love everything about their home. This home is an Energy Star Home with a HERS rating of 41. It has been featured in Granite State Builder magazine and selected to be one of 7 homes showcased for the New Hampshire parade of homes.